This is really interesting to note. The present/past tense issue just really makes clear how much of a shock this tragedy regarding Heath still is. It's clear that a lot of folks who care about Heath really haven't adjusted to the new reality yet. It did make me cry yet again though.I was so touched the way Ang kept slipping into the present tense.It is almost like as with some of us, he cannot beleve/come to terms with the fact that he has gone. Ang seems such a lovely man,quiet and considered, a real gentle man. Michael Stipe has paid tribute to Heath Ledger during R.E.M’s set at this year’s SXSW in Austin Texas. The front man dedicated the track ‘Until The Day Is Done’ to the actor as they gave the audience a taste of their new album ‘Accelerate’. Before performing the song he said, "This is dedicated to Heath Ledger who loved this song," before ending it with, "Goodbye Heath, we loved you!" The link doesn't work, it says "server error"
But thanks for posting anyway. 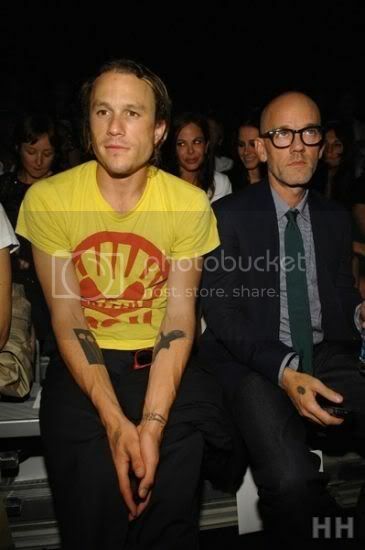 I think of the pics with Heath and Michael Stipe last year, sitting next to each other at a fashion event. It was last fall and they were introducing the spring 2008 collection. Who would have thought Heath wouldn't be around anymore in spring 2008? I think I'm gonna check out the lyrics of the song now. Michelle Williams is breaking her silence about the untimely death of her beloved Heath Ledger. The actress is speaking out in the new issue of Interview magazine. This is the first time she's talked publicly about Ledger since releasing a statement on February 1st. Says Williams, "I think the interesting thing about Heath, which maybe people have only really fully discovered in his death, is how vulnerable he was. You can pick it up on it in his performances, but it’s easy to overlook because he was so physical and beautiful and strong and masculine,” she adds. “But there was always that underlying sensitivity. That’s who he was. He had a talent for everything that he put his mind to. He didn’t know limits." Michelle also touches on Ledger’s history of sleeping issues. Ledger's ex-girlfriend, fellow Australian Naomi Watts, also chats to the mag about the deceased star. Says Watts, "I think he wanted to be someone who was doing the observing — not the one being observed. He hated not being able to go about his life in an ordinary way. But I think that, deep down, he enjoyed that he was being recognized for his talent. I think he was starting to own that and that's the deepest tragedy, in terms of his work. He was just beginning to own it and embrace it." Adding some color, she says, "He was a huge, obsessive, chess freak – and very, very good at it." Amy Pascal: "He was always introducing you to 3,000 mates whose names you can’t remember." Philip Seymour Hoffman: "Heath didn’t have the cynicism that this business can eventually put upon people, or the pretension that certain artists can carry with them sometimes. He had a really honest quality about him. He obviously had never lost his wide-eyed optimism." Michelle Williams: "I think that the interesting thing about Heath, which maybe people have only really fully discovered in his death, is how vulnerable he was. You can pick up on it in his performances, but it’s easy to overlook because he was so physical and beautiful and strong and masculine. But there was always that underlying sensitivity. That’s who he was." Sean Penn: "Heath was not simply a quiet and gifted actor who liked to go surfing, though that is how I primarily knew him in life. In the time we spent together, we spoke a bit about family, about travels, but most of all, about film.Yet, in his unassuming way, he never revealed to me the visual poet of the first order who I discovered watching the film clips he directed, music videos and such, after his death. His talent does speak volumes of the kind man, the loving father, and, in fact, the brilliant and gifted guy I really missed out on—that we all did, in the long run. Heath might have been a giant." Here's a link to the entire article on Heath in Interview magazine, complete with gorgeous photos. I think somebody's scanned the magazine, but if you keep clicking on each page, it zooms in enough that you can read it and see the photos clearly. One mix of photos seems to have been taken by Naomi Watts' brother around the time of the movie 'Ned Kelly'. Heath himself has drawn and written on most of them. Priceless! The one of Heath with Michelle, him pretending to be pregnant with her, is just so sweet. The great love and affection Heath's friends obviously felt for him, and the high esteem in which he was held, shines through in this moving article. Very beautiful. I loved it! It confirms so much of what I already thought about Heath, but didn't know for certain. I agree and Naomi Watts seems like she knew Heath through and through too, which I think is beautiful. They were together a long time, weren't they? Longer than he was with Michelle? They met on the set of Ned Kelley in Sept 2002 and had a two year "on again, off again" romance, from most of the sources I have seen. They broke up for good in May 2004. The filming of Brokeback was in the summer of 2004, right? So Heath and Michelle would have been together for about three years, announcing their breakup Sep 2007.